Card Deck 2 is other software developed by ezFlashcards. 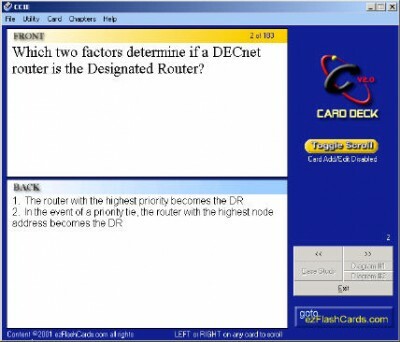 A digital flash card program to aid in the study of any subject. You are able create and edit your own cards. These cards can then be saved to a file and reopened for studying. Cards can be edited and added to a saved file. Maximum cards per file is based on computer memory up to a total of 15000 cards. Each card can have two graphics and one case study files assigned to it. A flash card file can be printed in three formats. This other software is shareware, which means you can download and use Card Deck 2 for free during the trial period (usually for 30 days). At the expiration of the period you will have to buy the other product for $26.95. Card Deck 2 is available at regnow and ezFlashcards website. Card Deck 2 supports English interface languages and works with Windows 98/Vista. Latest Card Deck 2 does not contain any spyware and/or advertise modules, allowing installing it with no worries concerning valuable information loss. Our website has thoroughly tested other product Card Deck 2, written the review and uploaded installation file (3956K) to our fast server. Downloading Card Deck 2 will take minute if you use fast ADSL connection. With iPod Flash Cards you can create flash cards for your iPod. For creating and studying Flash Cards on your PC. pyFlashCards is a application for creating and studying flash cards. Flash Quiz is a robust flash card-based studying/quizzing application.